Parents bring their kids to the doctor once a year for a physical check-up. Check-ups allow doctors to diagnose small issues before they become big issues. Check-ups allow us to know if a child’s growth is on track. Check-ups allow doctors to give parents information important to their child’s health. But how often do kids get a “spiritual check-up”? Thankfully, the opportunity to teach kids about the Fruit of the Spirit is also a wonderful way we can give kids a spiritual check-up. In addition to learning about the Fruit of the Spirit, kids will also come to understand the acts of the flesh (on an age-appropriate level) that tarnish their relationship with Christ and hinder their spiritual growth. Each can be taught in 10 to 15 minutes. These lessons contain a fresh, creative approach to looking at the fruits. The first lesson, Raisins and Grapes, teaches what happens to fruit when it leaves the vine, and likewise, what happens to Christians when they neglect God’s love and comfort. The second lesson, Weeds to Seeds, shows how Jesus pulls out the “weeds of the flesh,” and plants seeds that grow into the fruit of the spirit. The crafts are designed to give you some choices – often depending on what’s available in the supply closet or what sorts of talents you would like to show off and/or avoid! Each craft project is based around a central message. This way you won’t just be sending kids home with a craft, you’ll be sending them home with a message that makes it special. Each game either helps with memorization of the nine fruits of the spirit or it helps with applying the message to real life situations. Most kids know that apples turn brown after you bite or cut them, but they may not know why! After this demonstration of “oxidation,” they will not only understand why apples turn brown but they will also understand what happens when we get so involved in the world that we forget about Jesus! Our snacks are easy to make as well as incredibly yummy, and, like the crafts, students will learn as they create. You can also rest easy, with these snacks there are no chef training, fancy ingredients or kitchen required! In short, you get everything you need to teach kids not just what the nine Fruits of the Spirit are but also how to display these attributes in their day-to-day lives (at recess, at home with their siblings, when they speak to their teacher, etc). Memorizing the Fruit of the Spirit is a start, but LIVING the Fruit of the Spirit is far more important. Help your kids memorize the Fruit of the Spirit with our printable 11-page flip book! Each page reviews one of the Fruits of the Sprit and provides a short definition to help them display that virtue in their lives. Four pages print onto one 8 1/2 x 11 piece of paper or card stock. Just print, cut, punch holes and then attach with a book ring or string. 2- Encourage kids to write examples of how they have demonstrated that "Fruit" throughout the week on the back of each page. 3- Challenge the kids to study the flip book by a certain date and then have a contest to see who has memorized all nine Fruits of the Spirit. 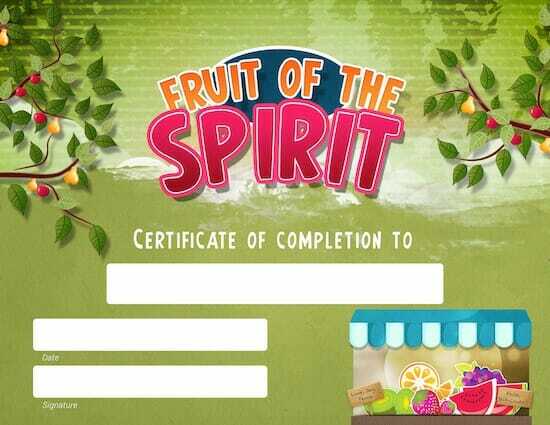 Use our printable 8.5 X 11 certificate to award students upon completion of the Fruit of the Spirit Lessons. Kids need praise and encouragement. 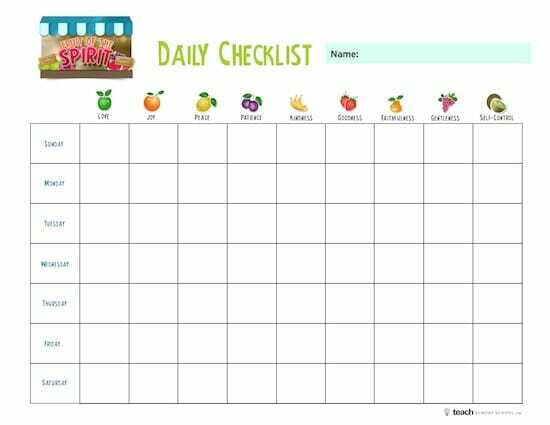 Help parents hold their kids accountable for demonstrating the Fruit of the Spirit in their daily life with this reward chart. You can send it home as "homework" and ask for the parents and kids to complete the boxes each day of the week. Parents can "catch their kids being good" and give them a checkmark for each of the 9 attributes. At the end of the week, kids can share their success and tales of putting the Fruit of the Spirit into action in their daily lives. & Reward Checklists as You Need! 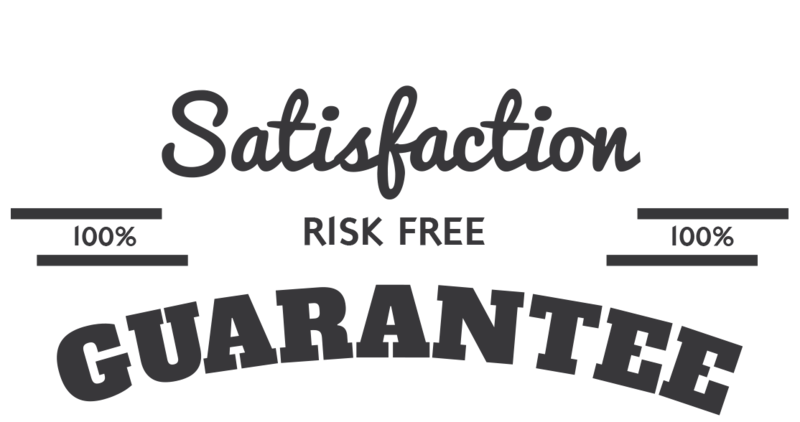 That’s right, we are so sure that you will love the Fruit of the Spirit Lesson Pack that we are offering an unconditional 100% money-back guarantee. One of the most important things we can do in this life is to bear good fruit for Jesus. By gaining this understanding while young, kids will be better able to develop a strong moral center that will guide them throughout their lives. 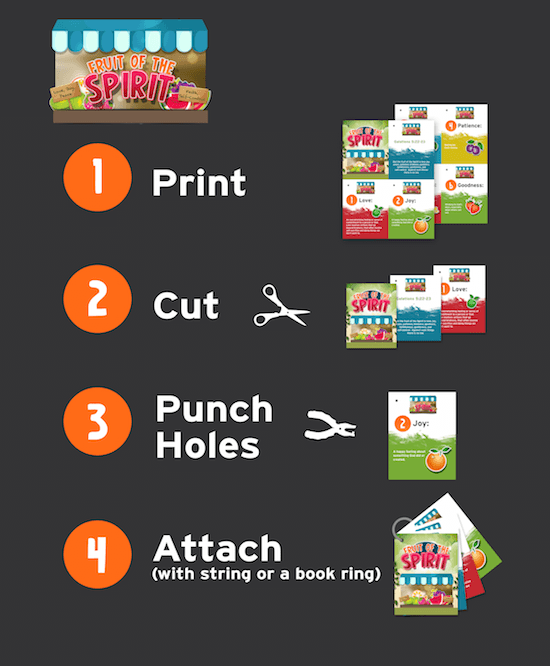 Our Fruit of the Spirit Lesson Pack provides a turn-key “Spiritual Tune-Up” for kids. It’s more than learning about a classic Bible topic; it’s about teaching kids to LIVE the Fruit of the Spirit in their daily lives. But the fruit of the Spirit is love, joy, peace, patience, kindness, goodness, faithfulness, gentleness, and self-control. Against such things there is no law. YES, I want in! 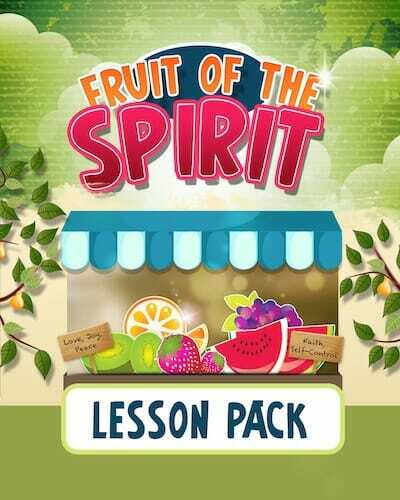 I want access to the "Fruit of the Spirit Lesson Pack". Please give me INSTANT access right now!